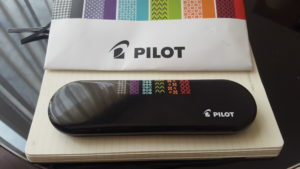 This week I’m checking out the Pilot Metropolitan: the number one fountain pen on Amazon and arguably the best beginner’s fountain pen ever made. This is the Honda Civic of pens. Like a Honda Civic, it delivers unrivaled quality for it’s price ($13) and it lasts forever even if you mistreat it. 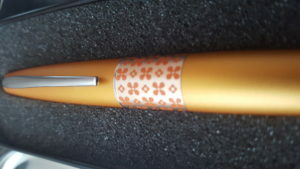 I wanted to love this pen. A part of me even wanted it to usurp last week’s pen, the Kaweco Sport, as my go-to. 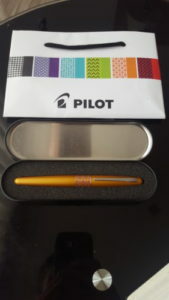 But there’s one fatal flaw–for me at least–that makes this the five star pen I’m going to re-gift at the first opportunity. 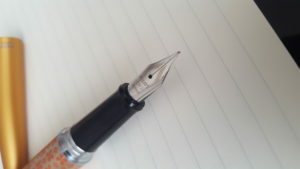 Like so many great writers, the Pilot Metropolitan is severely unbalanced. The barrel and cap are made out of brass. There’s a commanding heft to it, which I do like. But when the cap is posted, all the heft makes the pen top heavy. Your experience may differ, but I couldn’t find a comfortable way to write with the cap posted. Even with the cap completely off–where it will inevitably go missing–the barrel is still so much heavier than the plastic grip. This has more to do with the way I write and my personal taste than any fault in the design. But if this sounds like a writing experience you wouldn’t enjoy, may I suggest the Kaweco, which you could probably balance on your nose. 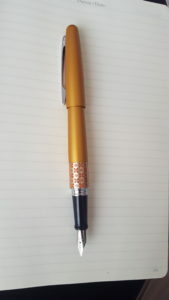 On your desk or in your hand, this is a gorgeous writing instrument. No pen under $20–and very few at any price–can compete with the Metropolitan in the looks department. Mine is from the Retro Pop series. Accented with an orange hippy flower print, it looks like the Porsche Janis Joplin died in. There’s also an Animal Print series, featuring white tiger, leopard, lizard, python, and crocodile. Those look a little goofy, if you ask me. The Metro has a steel nib that still manages to give you some warmth and just the right amount of feedback. It’s not scratchy, but it doesn’t let you forget that paper has a grain and texture. When I varied the pressure, I could control the line in a way that reminded me of writing with a calligraphy pen. I don’t have the penmanship to make the most of this, but it would be a treat for someone who does. The nib is long, like a less boxy Lamy Safari nib. This length could be where some of the springiness comes from. I found the Metro favors a vertical writing style, closer to an ordinary pen. I could see this being handy for a beginner who’s never given any thought to the angle of their writing utensil. Looks wise, the nib is precisely engineered but totally generic. It’s about as exciting as the suspension on a Honda Civic. That’s the point. I have no experience with the converter, but the Goulet Pen Company had good things to say about it in their video review. I didn’t like this pen but you’ll love it. 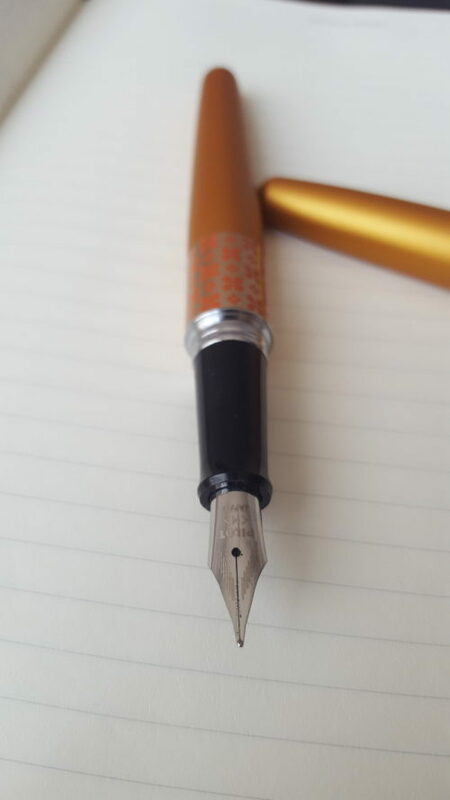 Everything about the Metropolitan is designed to give a good first impression to new fountain pen users and a reliable everyday writing experience to the ones who’ve moved on to something different. And you will move on. To go back to the Honda Civic analogy: you could say it’s reliable, you could say it’s boring. In either case, you’d be right.